Metastatic Cancers, cancers which spread from their primary site to other areas of the body, are very serious and lead to death in about ninety percent of patients afflicted with the disease. 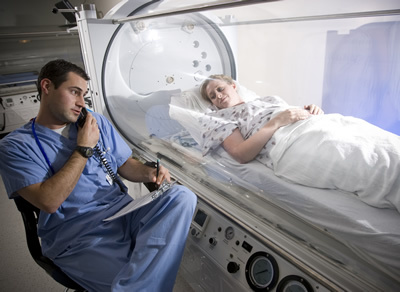 Now, scientists from the Hyperbaric Biomedical Research Laboratory at the University of South Florida have shown that a combination of diet and oxygen can significantly slow the progression of this devastating disease in animal experiments. Using hyperbaric oxygen (pure oxygen delivered in a pressure chamber) and a ketogenic (low carbohydrate) diet, mice suffering from advanced spreading cancers lived 78 percent longer than mice who did not receive the treatment. "Our study demonstrates the potential of these cost-effective, non-toxic therapies to contribute to current cancer treatment regimens and significantly improve the outcome of patients with advanced metastatic cancer." Some scientists now think that cancer cells form tumors grow by restricting blood vessel formation leading to the decreased oxygen environment in which they are found. Some also believe that tumors thrive on blood sugars and say that restricting dietary carbohydrates will slow the natural progression of cancer – with both theories contributing to this latest report. The research was based in part on the ideas of Professor Thomas Seyfried of Boston College, who asserts that cancer develops and spreads in people with chronic inflammation and respiratory insufficiency.